I'm having a hard time articulating my thoughts on this book. Part of me really wants to love it because of all the references to Canada and places that not only I knew but I had also been before, but the other part of me felt like the story overall was carried at times by these references. 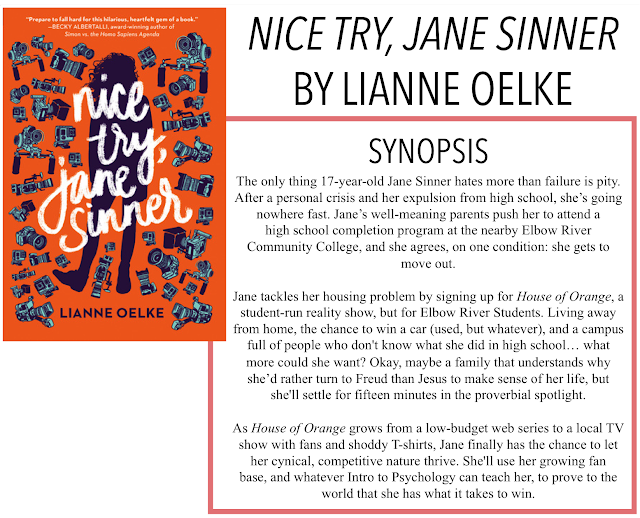 I am back with another book review, today it is Nice Try, Jane Sinner by Lianne Oelke. Thanks so much to NetGalley for providing me with an eARC of this book. As always, all opinions are my own. The story follows 17-year-old Jane Sinner who, after dropping out of her high school due to some personal issues, decides to start fresh at a new school, like her parents want. Her only request is that she can move out of their suffocating home. The only living situation Jane can afford is a house with five other roommates, that just happens to be a part of a social experiment akin to a reality show. In this Big Brother-esque house, Jane and the other contestants have to compete in challenges to win immunity and not get kicked out. The show is soon picked up by local TV and Jane finds herself at the helm of a group of fans dedicated to helping her win, that is, if she can make it that far. As I previously mentioned, and if you've been following my Goodreads updates, you'll know that I am a Canadian (specifically in Southern Alberta). I always get really excited to see both Canadian authors getting their name out there, because there are so few of them, especially in the YA genre, and to see books set in Canada being published. Most of the books (at least, that I've read) have been set mainly in the States, which is fine, but every once in a while you want to see places you recognize. And Oelke really delivered on that. She includes smaller details like getting a nosebleed because of the dry, Southern Alberta air, going to see the Flames play hockey, and of course, if you're an Albertan, the ever important Calgary vs. Edmonton city rivalry (just so we're clear, she got the better city right) as well as larger references to places like Fish Creek Park and Peter's Drive-In, both of which any self-respecting Calgarian has heard of and been to. But my concern with this book is that I was only really invested in the story to see these references. There was a lot of really important content going on that I think was lost because of the excitement over places I knew and the reality show aspect. The book talks about deeper issues like depression, a suicide attempt, a religious crisis of faith, religion in general, all really relevant things that don't get a lot of 'page-time' in most books but it didn't really keep these things as a focus. Soon, I found myself feeling like Jane's issues as plot points, which broke my heart because I was really hoping they would get more of a focus. At the same time, the geographical references and reality show element made this book unique and interesting, something I wanted to pick up. I can't imagine it being told any other way, I'm just disappointed that I ended up feeling this way. I will say, the writing style of this book was really unique and enjoyable. Jane has a cleverness and a super dry humour that I really enjoyed. There were a couple jokes she made that were self-deprecating but felt a little too severe. I figured out fairly early on that the personal issue that caused her to leave school in the first place was related to her depression and I felt like some of the jokes she made about it were, while possibly within her style of humour, in a bit of bad taste. The story itself was told in a journal format, one I haven't read in a while, but once you get going, you get used to it. I felt like there was enough information given in her POV to easily understand the story, but I wouldn't have minded an alternative perspective to break up a bit of Jane's humour. Overall, unfortunately, I think I just wanted to like this book more than I actually did.